Videoconvertsearch.com is the PUP that uses misleading techniques to prevent removal. Use Reimage to locate malicious components and get rid of them faster than with uninstall instructions. A full system scan blocks virus reappearance and prevents traffic to malicious domains. 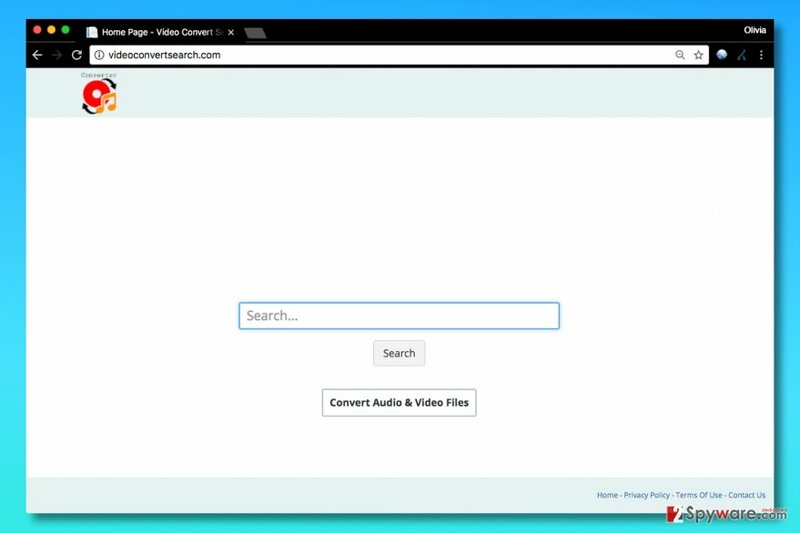 Videoconvertsearch.com is a vague search site that offers its services for whoever installs a browser hijacker associated with it. With the help of a potentially unwanted program (PUP) created by Hopebest Inc. Media, this search engine is actively promoted and emerge in more and more web browsers worldwide. To put it simply, Videoconvertsearch.com virus could emerge in your browser because it was bundled with a program that you recently installed. Since then, it hopped into your browser and meddled with homepage and default search provider settings. As a consequence, these settings now have hxxp://Videoconvertsearch.com/ value in them. Security experts at 2-Spyware recommend using anti-spyware programs for Videoconvertsearch removal. Keeping this potentially unwanted program (PUP) on your computer isn’t the best idea because it can sooner or later make you visit an untrustworthy Internet site. Continuous usage of this search engine will make you understand that it seeks to incorporate sponsored search results no matter what your search query is. Ask to provide sensitive details, such as your full name or credit card data. Of course, to lower the possibility of clicking on such search results accidentally, stop using the described search tool. To remove Videoconvertsearch.com from your browsers and change browser’s settings back to normal, we strongly recommend using Reimage or a similar anti-spyware program. 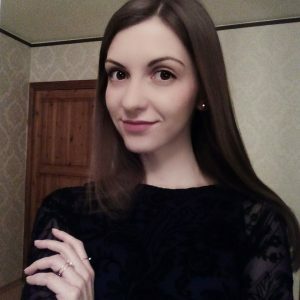 The reason why using anti-spyware program is a good idea is that it typically targets a different range of computer pests than typical antivirus programs. Videoconvertsearch.com virus attacks unprotected computer systems and changes browser settings without notifying the computer user. To prevent browser hijackers from sneaking into your PC unnoticeably, be extremely careful when installing any computer program. Usually, people download various free programs from the Internet and install them hastily. Besides, the “Next, Next, Install, Finish” approach is an entirely wrong one. You must re-check every statement written in the installer of your chosen software. We also advise you to be extremely careful when you notice some information presented to you in the fine print. Usually, these statements are meant to be unnoticed, although they provide critical information. In most cases, they say that by choosing “Default” or “Standard” software installation settings, you agree to install all suggested programs. You can refuse to install these programs, but you need to choose “Custom” or “Advanced” installation option first. Once you perform this small change, uncheck every box next to agreements to install unwanted/unknown software along with your chosen one. It is essential to remove Videoconvertsearch.com virus if you want to surf the world wide web safely. This obscure search tool hardly cares about the reliability of results it presents, and we do not believe that such search tool can be trusted. There are plenty of search engines that are more trustworthy – you only have to pick the one you want to use. 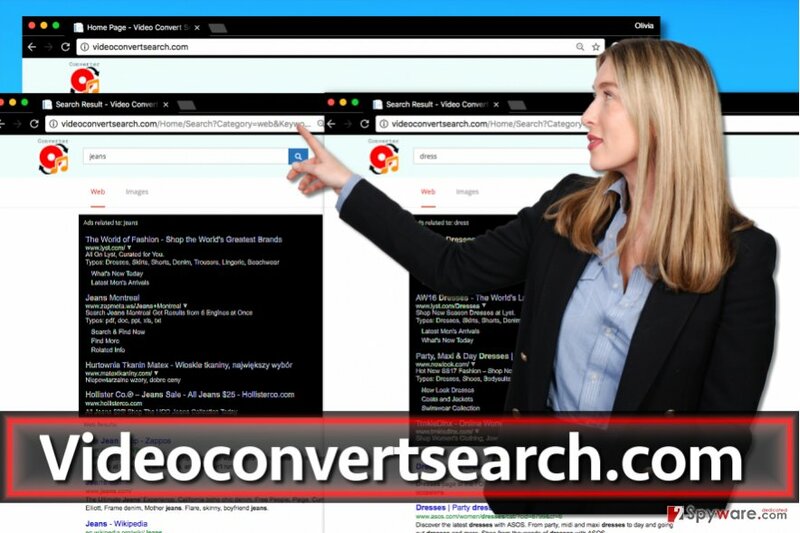 Before you begin Videoconvertsearch.com removal, we want to remind you that it is highly advisable to uninstall programs that are the ones to blame for inviting Videoconvertsearch redirect virus to your system. You can find a full explanation on how to do it below. To uninstall programs related to Videoconvertsearch, we suggest using tips provided below. Do not forget to uninstall programs that brought the browser hijacker into your system. Once you get rid of suspicious software, clean up browser shortcuts. Here, look for Videoconvertsearch.com or any other recently installed suspicious programs. Check the Applications folder and remove apps associated with Videoconvertsearch.com. Wait until you see Applications folder and look for Videoconvertsearch.com or any other suspicious programs on it. Now right click on every of such entries and select Move to Trash. When in the new window, check Delete personal settings and select Reset again to complete Videoconvertsearch.com removal. Once these steps are finished, Videoconvertsearch.com should be removed from your Microsoft Edge browser. Remove Video Convert Search extension from Firefox. Here, select Videoconvertsearch.com and other questionable plugins. Click Remove to delete these entries. Now you will see Reset Firefox to its default state message with Reset Firefox button. Click this button for several times and complete Videoconvertsearch.com removal. To eliminate Videoconvertsearch.com from Chrome, delete all extensions that have anything to do with video converting. Here, select Videoconvertsearch.com and other malicious plugins and select trash icon to delete these entries. Click Reset to confirm this action and complete Videoconvertsearch.com removal. Here, select Extensions and look for Videoconvertsearch.com or other suspicious entries. Click on the Uninstall button to get rid each of them. Here, look at the Homepage field. If it was altered by Videoconvertsearch.com, remove unwanted link and enter the one that you want to use for your searches. Remember to include the "http://" before typing in the address of the page. Now you will see a detailed dialog window filled with reset options. All of those options are usually checked, but you can specify which of them you want to reset. Click the Reset button to complete Videoconvertsearch.com removal process. ^ DieViren. DieViren DE. Virus Removal Tutorials, Latest Security News. ^ Alfred Ng. Microsoft: 250M devices infected with Fireball is ‘overblown’. CNET News - Technology News. Top Technology News, with Investigative Reporting and In-depth Coverage of Tech Issues and Events. This entry was posted on 2017-07-18 at 03:29 and is filed under Stealing programs, Viruses. You can quickly scan the QR code with your mobile device and have Videoconvertsearch.com virus manual removal instructions right in your pocket. How did you remove Videoconvertsearch.com virus?